Celebrities from the world of literature and theatre are united in their support for the annual festivities about to get under way in Shakespeare’s home town. 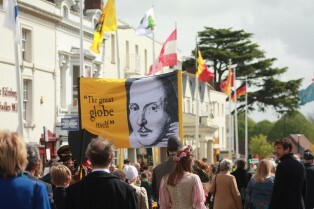 Shakespeare’s 451st Birthday Celebrations reach their climax on Saturday 25th April with the iconic annual parade through the streets of Stratford-upon-Avon. It’s the highlight of a feast of entertainment throughout the festival weekend which has something to please everyone. The commemorative events have taken place since 1824 but the aim remains the same: to remember the fascinating legacy of William Shakespeare, playwright and poet, and to celebrate it here for generations to come. All the traditional ceremonies and customs will be happening over a packed 4 day period beginning on Shakespeare’s actual birthday, 23rd April. There are events, activities and entertainment, the vast majority free of charge, for all the family to enjoy. The spectacular Parade will kick off at 10.30am on Saturday 25th April this year, with West Midlands Fire Service Band leading guests from the Town Hall to Bridge Street ready for the ceremonies. 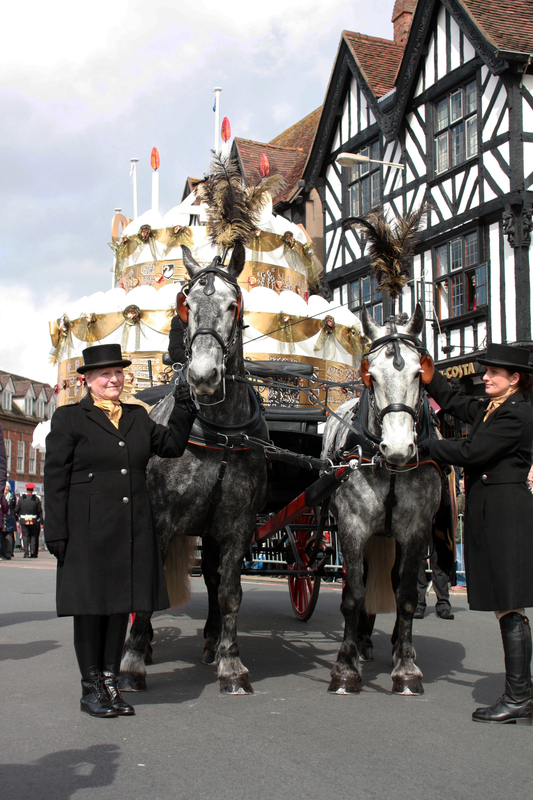 ‘Shakespeare’ will leave his birthplace in Henley Street with Coventry Corps of Drums and his Horse Drawn Birthday Cake, which will be led by horses Vesper and Beatrice. They will then begin the symbolic ‘cradle to grave’ journey. The lively and colourful procession will take a newly extended route via Shakespeare’s Birthplace to Holy Trinity Church to symbolise the Bard’s life journey in the town, from the cradle to the grave and give more people a chance to watch the spectacle as it takes in Wood Street, Windsor Street and Henley Street. There will be a variety of events and activities throughout the town all day and at 4pm visitors will be treated to The Great Morris Flashmob which will be taking place at Bancroft Gardens. The day will come to a close at 7.30pm with a ‘Singing Shakespeare’ concert in the Guild Chapel with Khymerikal – a contemporary chamber ensemble specialising in the performance of twentieth and twenty-first century. Throughout the day, there will be plenty going on to entertain everyone, including a Shakespeare Show Window Trail Competition offering some competitive family fun. Look out for shops with black and gold balloons outside and window displays with a Shakespeare theme! There is a new approach to funding the event through Shakespeare’s Celebrations: a local initiative jointly led by Stratford-upon-Avon Town Council and Stratford-on-Avon District Council to generate financial and practical support for the traditional celebrations and safeguard their future for the town. After an impressive debut last year, Shakespeare’s Big Birthday Cake makes a welcome return to the parade, freshly decorated with a ‘Battle of Agincourt’ theme by community arts groups and local schoolchildren. It will once again take pride of place on its horse drawn carriage. Beyond the 2015 festivities, local organisations including key players: Shakespeare Birthplace Trust, the Royal Shakespeare Company and Stratforward Business Improvement District Company, will be working with Shakespeare’s Celebrations to develop a special timetable of events for another landmark year in 2016. Four hundred years since Shakespeare’s passing there are plans for even more exciting things to see and do at next year’s festival! Visit www.shakespearescelebrations.com for full details of what’s happening when and where at Shakespeare’s Birthday Celebrations 2015. Journalists and photographers wishing to cover the Birthday Celebrations on 25 April 2015 in Stratford upon Avon should register their interest now in order to obtain accreditation. Please email murphy@syndicatecomms.co.uk for further information. Shakespeare’s Celebrations is an initiative jointly led by Stratford upon Avon Town Council and Stratford upon Avon District Council, working to safeguard the future of the traditional Shakespeare Birthday Celebrations. Key organisations in Stratford including Shakespeare Birthplace Trust, the Royal Shakespeare Company and Stratforward will be working with them to develop a major timetable of events for 2016 to celebrate the legacy of the Bard 400 years after his death in 1616.